The process of email delivery via an SMTP server doesn’t come with a native safety layer: that is why it’s advisable to set a secure SMTP and make sure that your emails are encrypted and not exposed to view. This can be also requested by some SMTP servers themselves: you acknowledge this when you get the typical error message “SMTP server requires a secure connection”. 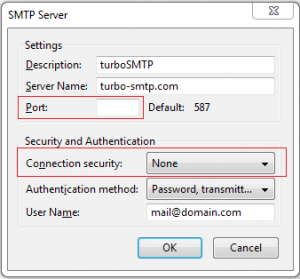 The most common way to provide it is to configure an SSL connection (Secure Sockets Layers) or a STARTTLS one and switch to a secure SMTP port – 465 or 25025 instead of the “classical” port 25. Remember anyhow that only a professional service like turboSMTP employs white-listed, truly reliable servers to guarantee the , as well as the best deliverability for your messages.